For a lot of years I ate a bowl of cereal every morning. I still know the importance of the having breakfast, but my bowl of cereal has been replaced with a morning smoothie. I enjoy smoothies for a lot of reasons. They taste great (usually), they are quick and easy to make and I can drink them while I work. I can also make sure that I get my daily fruit and vegetables by blending them in a smoothie. I try to make sure that I get a variety of nutrients in my smoothies, and I do this by aiming to have a different colour smoothie each time I make one. An red smoothie often has berries in it while a green smoothie generally has more vegetables in it. Sometimes I am surprised by how good a smoothie is after I put it together, and sometimes I need to go back to the drawing board (do not put celery in smoothies…it’s not good). 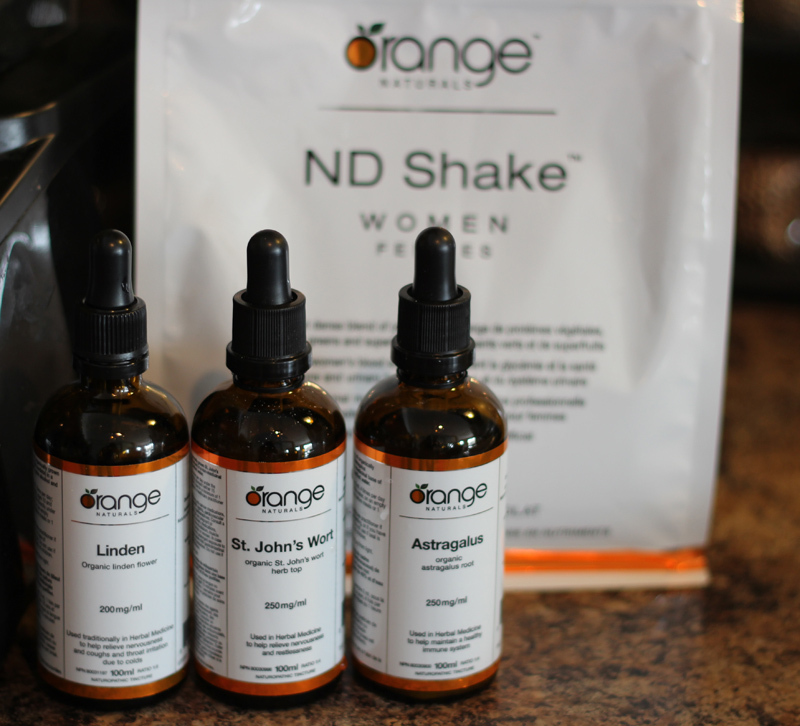 Another way I can make sure I stay healthy is to include ND Shake Mix in my smoothies and also some of my favourite tinctures from Orange Naturals. I use Orange Naturals tinctures that are unique to my needs. Linden is helpful for restlessness and relieves coughs and throat complaints due to colds. It also aids with minor kidney and bladder problems. St. John’s Wort is calming and provides mild pain relief, and Astragalus has a host of benefits including helping to ward off colds and flus. I have definitely been feeling more energetic since adding these tinctures to my daily routine. Today I had a green smoothie for lunch, since I had a special breakfast with the kids in the morning. This green smoothie was naturally sweet and so delicious that I have to share the recipe with you. 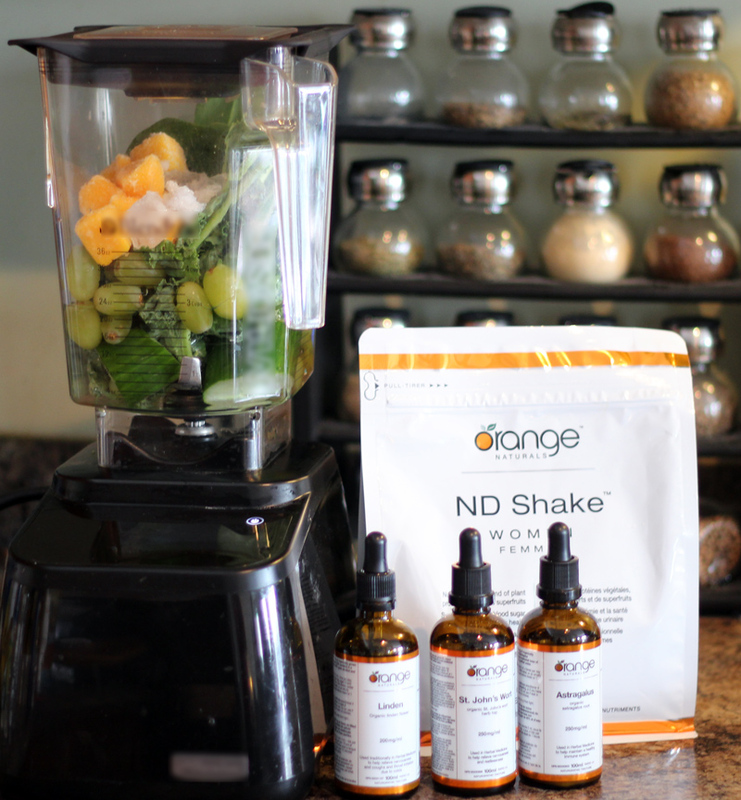 I added the tinctures to this smoothie and you can add whatever flavour of ND Shake Mix that you prefer. A fruit and vegetable smoothie. Add all ingredients to the blender and mix until thoroughly blended. 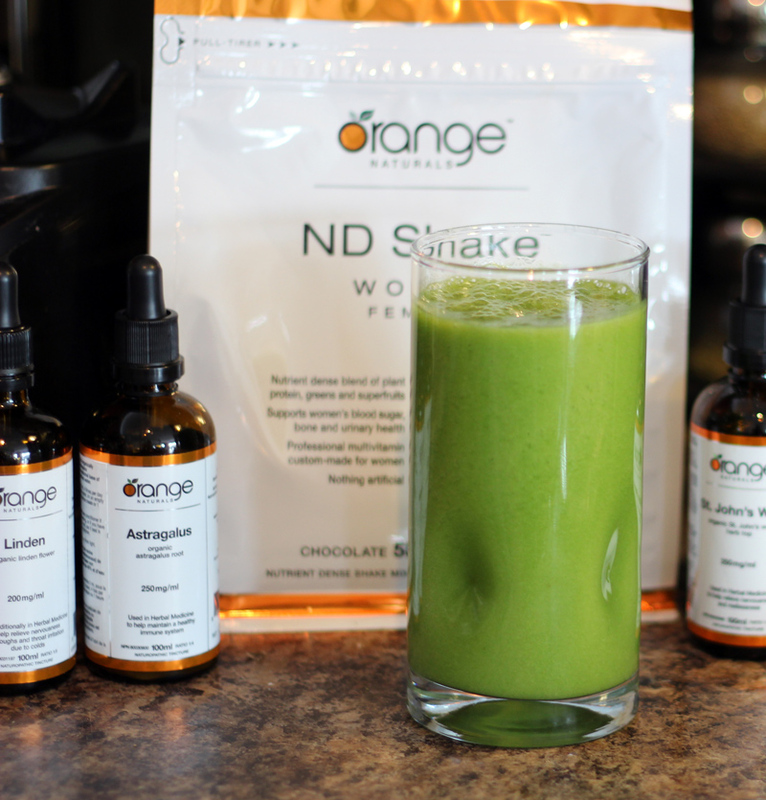 ND Shakes was featured on the Global Morning Show and will air on Steven and Chris on April 18th and they came up with their own delicious smoothie creations. 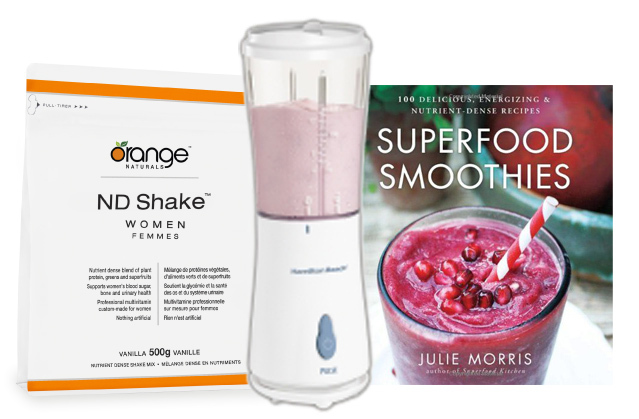 One of my lucky readers will win a set of ND Shakes for the family, a Hamilton Beach Personal Blender and a Superfood Smoothies recipe book, valued at $175. Prize may not be exactly as show. I love blueberries, or any kind of berry or fruit! What a vibrant green your smoothie is! We tried kale smoothies are weren’t big fans, I think I’ll try your recipe and give it a second chance. Blueberries, Strawberries, Vanilla almond milk, spinach and of course flax & chia seeds! Yum!! My favorite smoothie ingredients are Kale, Spinach, Wild Black Cherries, Blueberries and Pineapple! Yumm! Love banana’s! Always keep them in the freezer and ready to pop into smoothies! I like strawberries in my smoothies. My favourite smoothie ingredient is strawberry yogurt for extra decadence. My favorite smoothie ingredient is frozen bananas. Bananas are my favourite smoothie ingredient! I won’t be using kale leaves or spinach, but this looks like it would be great for all the fruit smoothies I make. Love frozen fruits use instead of ice, and soya protein, a must for smoothies 🙂 juice is a huge must as well be it orange or pineapple or cranberry . Thanks for chance. I love bananas, strawberries and yogurt in my smoothies. My favorite smoothie ingredient is mango. I love mangoes in my smoothies! I’m obsessed with all things mango. my favourite smoothie ingredients are yogurt and blueberries. Frozen strawberries, oj, banana and yogurt make for a perfect smoothie! I like to sprinkle hemp seeds over my fruit smoothie. I usually have banana and then I like to add strawberries or frozen chunks of mangos, and sometimes a dollop of low fat plain yogurt. Mango and banana are my favourite smoothie ingredients. Love having Cherries in them. I like to add strawberries and bananas to my smoothie. I like strawberry, banana, kiwi and yogurt in a smoothie. My go to ingredient is strawberries. I love adding Hemp Hearts, Chia and spinach! My favourite smoothie ingredient is mango. Strawberries and blueberries are my favourite ingredients. My favourite is strawberries…not sure if i would like the green smoothies! banana is top of the list. My fave ingredients are berries! My favourite smoothie ingredients are bananas, blueberries and yogurt. My fav ingredient is spinach; healthy and the kids don’t even notice I’ve sneaked it in! I really like mango’s or passion fruit in my smoothie. Amazing flavours. My favorite smoothie ingredient is blueberries. I like putting soy milk, fruit and yogurt. I like almost any fruit in my smoothie, but strawberries and kiwi are my favourites. Peach, I just love the fresh taste of peach! My favourite smoothie ingredient is almond butter. Adds a nice nuttiness and some protein. My favourite ingredients are yogurt with berries such as strawberries and blueberries. I love berries in my smoothies! If I get one of these I will be making alot of smooties. Strawberries and chocolate protein shake mix. I like Banana, Yogurt, Ice, Berries and Juice in my smoothies. Oh what a great prize pack, and smoothies are so popular right now!!! My fave ingrediants are berries, kale, almond milk, oatmeal, peanut butter and cinnamon. Strawberries are my favorite in a smoothie for sure! I love bananas, raspberries and some grated dark chocolate! I like to use an apple, banana and strawberries and spinach. My favorite smoothie ingredients are yogurt and bananas. My favorite smoothie ingredient is frozen strawberries! MY wife would love this prize. strawberries!! they make all smoothies delicious. My favorite smoothie ingredients are protein powder, blueberries and strawberries. My favourite smoothie ingredients are strawberries and bananas. I love to add a banana to my smoothies. Lately Ive been adding frozen cherries. So good!! I like pineapples, raspberries, yogurt and protein powder. Cucumber if a savoury smoothie. Raw cacao if a sweet smoothie. I love to add pineapple to my smoothies. i like apples, pears and chia seeds in my smoothies. Strawberries, blueberries, blackberries. I like them all. I love strawberries in my smoothies! I love blueberries and vanilla yogurt. I love berries in my smoothies. Strawberries are my favorite ingredient. I love to make a mixed berry with flax seed and throw in a few veggies! I like bananas, strawberries and almond milk.